Union Visual Effects in the UK did 61 visual effects shots on Three Billboards outside Ebbing, Missouri for director Martin McDonagh. Union VFX has recently moved to their new offices in Rathbone Place, doubling in size. They are known for smaller but highly well regarded and high profile cinema and TV work. This small film, with an estimated budget of just $15M, had an incredible array of talented actors, and was nominated for seven Oscars at this year's 90th Academy Awards. Most notable, both Sam Rockwell won for Best Supporting Actor and Francis McDormand won for Best Performance by an Actress in a Leading Role. The film tells the story of a mother who personally challenges the local police to solve her daughter's murder when they fail to catch the culprit. "This was one of the most enjoyable projects I’ve worked on. Martin (McDonagh) knew exactly what he wanted and we had a lot of fun," commented Union VFX Supervisor Simon Hughes. "We’re really proud to have been part of bringing this film to the screen and it’s really gratifying to see it gaining so much acclaim. We were so thrilled with the reception the film had at the Oscars!" Above is a breakdown of the key sequences in the film by Union Visual Effects. 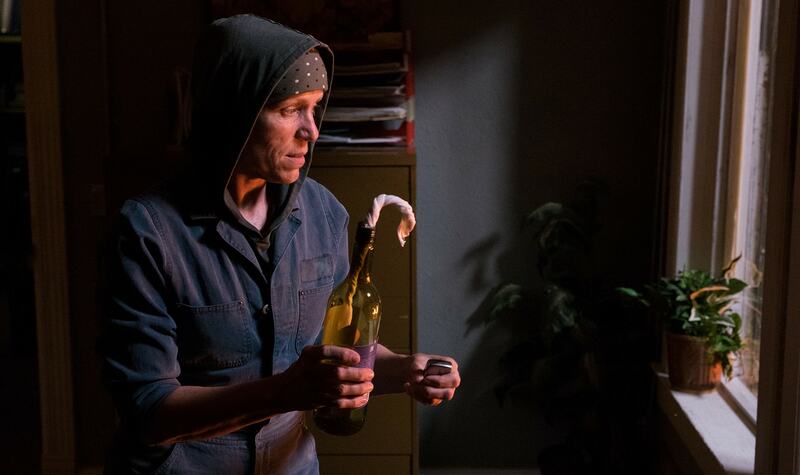 McDormand's highly accurate movie throwing skills were achieved based on plate photography of her throwing a prop molotov cocktail, which landed far short of the police station. "Once they were released from her hand we painted them out and replaced them with a CG molotov with burning wick (built in Houdini) and reanimated so that they hit their target," says Hughes. "The explosion in the police station was built from an elements shoot where we filmed several explosions with different timings and ferocity from outside and inside." Inside the station, unknown to McDormand's character, is the fired policemen Dixon played by Sam Rockwell. For the interior shots where the flames and explosion engulf Dixon, a fire safe set of the room was built. "Sam was lit and filmed on a jerk rig," Hughes recalls. "He then left the set and the SFX team did it for real. We composited it all together making sure to match the volume of the fire as well as adding additional fire in close proximity to and on the body and head of the stunt double to make it look more dangerous." The Union pipeline for the film centered around Houdini for all of the CG. This was used for the simulation, elements, the molotov cocktails, and dentist’s drill scene. Union also rendered in SideFX's Mantra. The camera tracking was all performed in PFtrack and the team then composited the final shots in Foundry's Nuke. Nuke was also critical in the deer sequence. In one of the film's few touching quiet moments, Frances McDormand's character Mildred Hayes meets a deer next to the film's three billboards. The deer was a composite a live action green screen deer. To seamlessly composite the deer took attention to detail on the shoot, and some digital / grading relighting. "It took a bit of both. We took care to film at the same time of day to replicate the natural light as much as possible for the elements shoot. We did however have to do some digital grading in Nuke to get them to totally match," comments Hughes. A larger sequence was the torching of the billboards in a dramatic fire sequence. The team used a mixture of techniques. "Frances was filmed in the location with some flames on the periphery at a safe distance with a bit of lighting help," explains Hughes. "We then did an elements shoot on the same night where we burnt the actual billboards several times with different degrees of ferocity from different angles." "We added a lot of CG fire, embers and ash," Hughes relates. "We particularly focussed on shots where the fire was interacting with action from Frances and the fire extinguisher as the fire needed the fire to behave in specific ways to be believable." There was a lot of invisible Nuke compositing work across the whole sequence to match the continuity especially in the flames on the different signs. "The flames were going in many different directions as well as being different degrees of intensity in the different takes and element shoot so there was a lot of matching required," he adds. The film's location Ebbing, in the U.S. state of Missouri, is fictional. Principal photography began on May 2, 2016 in North Carolina and ran for 33 days. Hughes comments "I did two trips out to Carolina with Martin and the creative team to reccy (reconnaissance) and plan all the VFX. Martin had a really clear idea of what he wanted and pretty much stuck to the plan during the actual shoot." McDonagh was inspired to write Three Billboards Outside Ebbing, Missouri after seeing billboards about an unsolved crime while traveling around the Georgia, Florida, Alabama corner of the USA. "The rage that put a bunch of billboards like that up was palpable and stayed with me," McDonagh said in an interview with Collider. In one of the most unexpected and frankly disturbing scenes in the film, the dentist fight, Union needed to have Mildred drill into her dentist's thumb. To achieve this Union augmented the dental drill so that the drill bit could penetrate the nail "leaving a nasty exit wound and a pretty shocked victim" Hughes jokes. "We built the drill bit in Houdini and simulated a fracture in the nail, adding blood and nail debris," says Hughes. "We also did some clever compositing to make it look like blood was pooling in the nail under the drill bit causing bruising and instigating a grimace from the audience."